Semi second leg has to be up there. A game where Dyer was absolutely shocking yet scored a hat-trick. Tomas Brolin was awesome in this game, then it all went downhill. Yes, he should have had 6 that day! Ian Wright's 2nd and Palace's 3rd in the last minute of the 1989 play off final at Selhurst. The culmination of seeing a side come together over 3 years or so, having missed out on play offs in the previous couple of years, knowing we would finally be back in the top division and keep hold of Ian Wright. When we scored up there in the last minute to make it 1-2 then they went straight down the other end to get a third.Got soaked on the way back to the station.Terrible day but the second leg wow ! If I remember that game the winner came from a sublime cross from Lombardo. I think both goals were headers but I can't remember Attilio providing the cross for the winner. Must be nearly 20 years ago. 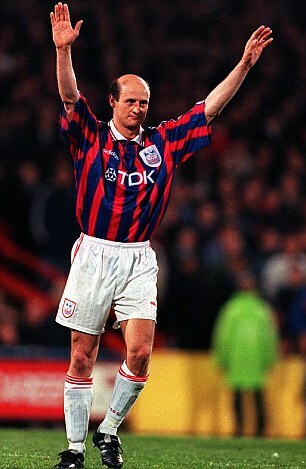 Any excuse to post a picture of the bald eagle wearing one of the best Palace shirts.